This is the transcript of Fernando Macia’s presentation at The Inbounder event that took place in Valencia on 19th of May, 2016. You can also download the deck he used here. Users prefer buying in an environment where they feel that they can make their own informed, responsible and free purchase decisions. Online advertising is perceived as intrusive and when advertising enters through the door, users escape through the window. What they request is having the right information at the right moment. If we are able to anticipate what that information should be, our Web sites will be optimized not only to be findable in a much wider range of keywords but also to stick to the user from the very first contact and stand by him until he is ready to convert. 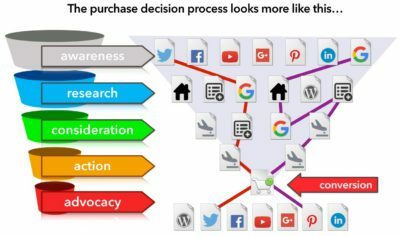 Customer journey analysis and search scenarios open up a new approach to SEO closer to the users’ purchase decision process. Let me begin with a story. Actually, it is an old joke about a salesman. “This is a fabulous fishing rod: flexible and light, but really strong at the same time. You will enjoy fishing for hours and won’t feel tired of it”– was saying the salesman. “Oh, wow, you’re right. I’ll take the fishing rod… but…. “– doubted the customer. “I can’t actually stand up for hours. My backache will kill me”– complained the customer. “No, if you take this extra-comfortable folding chair, it won’t. It is very light and you can take it to your favourite fishing spot”– offered the salesman. “Hey, great. Then I’ll buy the chair too”– admitted the customer. “What if you feel hungry? Why don’t you buy this convenient barbecue? Can you imagine yourself preparing a delicious lunch after a good morning fishing session?”– suggested the salesman. “Hey, I love barbecue, especially in the open air. You are right. I’ll take the barbecue too”– said the customer. “But, of course, staying outside and walking by the river will sure make you thirsty. What about having a good bunch of ice-cold beers handy? In this portable cooler you can take your cold beer wherever you want”– said the salesman, showing a glowing blue cooler. “Man, that would be great! I’ll buy the cooler too”. So they go on and on and on like that and, to make a long story short, the poor customer ends up even buying a caravan and a 4WD before leaving the store. Can you imagine his supervisor’s face? “C’mon Phil, I had never ever seen anybody selling like you just did! You are absolutely amazing! This man just came to the store to get a new fishing rod and you made him buy a caravan and even a 4WD!”– exclaimed the supervisor very excited. A customer’s behaviour is often inscrutable. Frequently, it’s almost impossible to identify the circumstances, the ad, the news, the fact that actually triggered the search intent in the user for the very first time. How, at a certain moment, customers become aware of a certain need and start their own customer journey from this very first search intent and all the way through to our final buying decision. A savvy salesman will stand by his customer and stay alert for any motivation or objection He will stick on whatever motivation to amplify it and will have good arguments ready to fight back any objection. 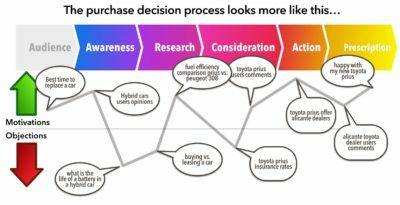 Customers’ purchase decision is driven forward by their motivations, even when they are not yet fully aware of what exactly those motivations are. Customers’ purchase decisions are often stopped or delayed by their objections, their doubts or when they feel they should collect additional data in order to come to the right decision. Customers need information, and they will require even more information when they feel that the risk to make the wrong decision is big or when there is a chance to get a bigger benefit from a wiser decision. Sometimes, being ready for conversion will require a step-by-step approach. On the Internet, there are no salesmen. All we have is Web pages, mobile applications, social profiles, content and functionalities. We cannot spot, at least for the time being, whether a user’s mouth is watering whilst he is looking at the latest iPhone model, or whether he is terrified and frustrated by its price tag. Although customers have gained prominence on the Web 2.0, online sales are mostly a unidirectional communication process. So we have to find ways to identify what these motivations and objections are. We have to know what data, what information will be considered enough by the user, so he can feel comfortable to make a purchase decision. A funnel or a sieve? 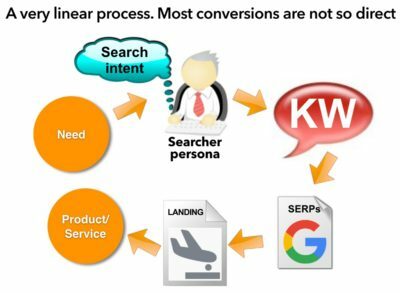 As marketers, we have been describing this process as a funnel, a conversion funnel, with some contents and searches, which are key at each one of the stages of the funnel. For instance, the search intent might be triggered by something we read on a blog, a spot on TV, or some related search. Usually, when we begin our search to document our purchase decision, our first searches are very generic. As we identify the characteristics that best suit our needs, we narrow down our search to consider just a few options. And finally, we feel ready for conversion and sharing of our purchase decision. Customers react in different ways to different sales arguments. And while for some people buying a €15 T-shirt is an impulse purchase, for some lucky folks that threshold might be much higher, in the hundreds of Euros. This threshold is different for every user, and usually the higher the price, the longer the customer journey. If we feel that a certain purchase decision involves a high risk, we will take the time and the effort to search, compare, and find all the answers to every objection, so we can feel sure that we’re making a more informed choice. And, as we’ve seen in the story at the beginning, many times there is no direct cause-effect relationship between an initial search and a final buying intent. The Web is the perfect environment for procrastination. So, the traditional tools and methods for keyword research are not enough any more. Synonyms, semantic field, related terms are not the complete answer any more. So, perhaps we should put the funnel concept to question. In real life, we use a funnel so that none of the liquid we are pouring is lost. But when we refer to the conversion funnel and find that the average conversion ratio in Spanish online stores is 1%, the funnel metaphor is not valid any more. Most of the visitors that we drive into the funnel actually escape from it at some point. It looks more like a sieve! SEO is not just about keywords any more! We identify some initial keywords that we use as seeds for our favourite keyword suggestion tool. We find some related search terms and select the best assets in our Web sites for each one of them. We optimize each page for its target keyword spreading the right terms here and there, in the right, prominent spots of the page. And we try to grow the page’s authority with internal and external links. But getting top positions is getting harder and harder. Organic results are not the main content on the SERPs any more, and even being the first organic position does not guarantee a good CTR anymore. Local, personalized and mobile results make it even more difficult to control the position we occupy. And there are domains, which concentrate lots of authority and popularity, so there is little chance that they will not monopolize the top positions. We used to identify the best assets in our Web sites for each one of our target keywords. Once we identified the right page, we used to optimize it for this keyword spreading the right terms here and there, in the right, prominent spots. This approach makes our strategy very linear: we identify some keywords, find some related search terms with Google Keyword Planner or any other keyword suggestion tool and optimize our pages for them. It is high time we start to think that SEO is not about keywords any more. Or, at the very least, not only about keywords any more. All these tools rely on synonyms, semantic field and other semantic relationships. However, most of the time the relationship between different keywords that are key at each micro-moment do not share a semantic relationship among them, but rather a sequential or a chronological relationship, where they fit to fill in the gaps between each micro-moment and the following one on the way to conversion. We have to spread our SEO work over the entire customer journey, and look at it from a global perspective. We have to use our insights to build probable, popular search scenarios, where we can identify all those micro-moments making up the entire purchase decision process. For instance, for a travel Web site, a search like “disneyland offer” would be very worth to compete for. And that is correct as long as you are one of the leading travel Web sites. But if you are not –and if you are not in the first results page for the keyword – then you have to find additional opportunities to be findable by your potential customers. 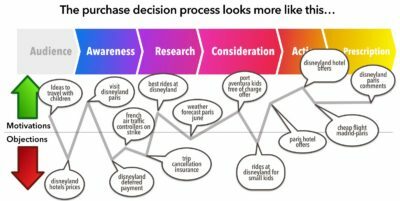 If we analyze the customer journey that brought our user to this search –“disneyland offer”–, we find that, in reality, it is only the last search from a process that began perhaps two or three months ago, on a rainy Sunday afternoon, searching for ideas to travel with children. Perhaps our guy found a post about what a good idea it was to combine Paris as the perfect romantic destination with spending some time at Disneyland with the kids. And finally, it is possible that both during their trip, or immediately after coming back home they would share their experience, comments and opinions about Disneyland Paris. This means that we must not focus on a certain keyword, but instead we have many different micro-moments –all of which make up this customer journey– and each one of these micro-moments is, in itself, an opportunity to make our Web sites findable at different stages of the decision process, and for easier, less competitive keywords. Therefore, it is not so much about producing the best content, it is not about producing a lot of content, either. It is not even about producing viral content. All of that is good to improve our chances to be found, but what we really need is content that drives sales, content that will connect with the buyers’ motivations, content that will answer all of their objections, content that will make them feel as though they are not being pushed to come to a purchase decision but, instead, will make them feel as though their choice was the best possible one. Thus, it is not so much about producing good content or a lot of content but, instead, about producing just the right content and linking to it from the right places. Sales arguments that connect with the customers buying motivations make the purchase decision move forward, while the objections delay it. If we are able to identify these motivations and amplify them, we will make the customer progress faster to his purchase decision. If we are not able to counterargument his objections, the purchase decision will be delayed forever. So, there is no point in centering all of our efforts in trying to be first for the most obvious search: “toyota prius alicante offers”. There are a lot of related and anticipatory searches. If we are able to predict this scenario to some extent, we will be able to prepare our Web sites to be visible and findable for many of these micro-moments happening all along. Of course, this approach raises a lot of different implications, both in the information architecture and in the page structure of the different templates of our Web sites. Tune in to find out about search scenarios in the second part of this post.